In November 2018, the winners of the Canadian Centre for Architecture’s (CCA) Interuniversity 2018 Charrette were announced. The theme was entitled ‘Housing One by One', where each team of students were to incorporate prefabrication and architecture into an adaptable construction kit that addresses the need for affordable housing. The goal? Each team had to envision how a single 1-metre square module could be integrated to shape diverse housing patterns in a site-specific location. The Charrette is organized by the CCA and the Université du Québec à Montréal, in collaboration with numerous other Canadian universities. Placing first in the competition is a team of second and third-year architectural science students from Toronto's Ryerson University. 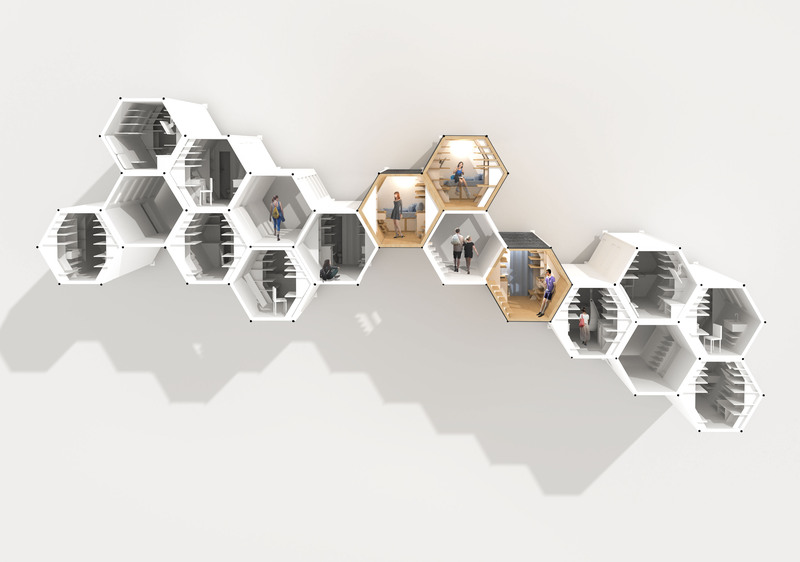 Their concept centred on using a modular hexagonal housing unit integrated into a unique site of unused city spaces (think of parking lots, the underside of bridges, and alleyways). The team utilized existing structures and unused space as a way to address modular and micro-home living. They addressed the need for affordable housing by minimizing material costs and construction duration, all while optimizing user-customization, aesthetics, and functionality. 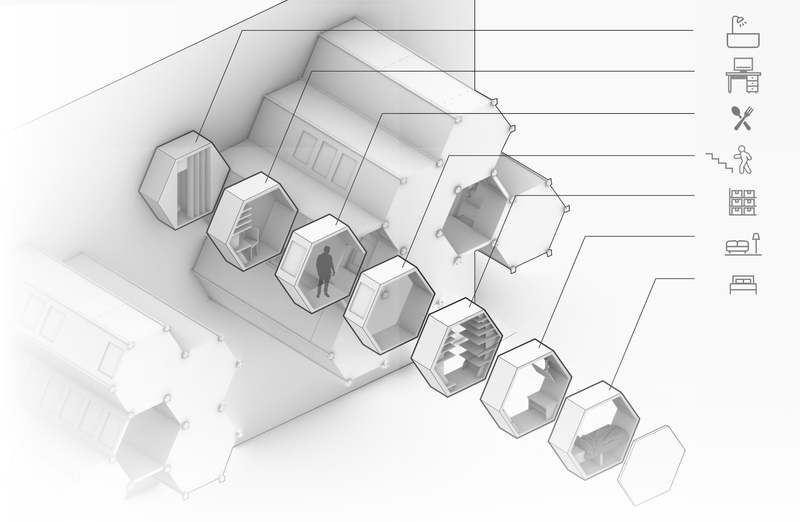 The hexagonal shape derived from a honeycomb form, allowing for the interlocking of base modules from an exterior entrance connected to an assumed, existing circulation path. With modular housing already present in the market, the winning team’s concept is a kit-bashing of prefabricated spaces. Depending on the user’s needs, it allows for a “mix-and-match” of various programs. Whether you want 2 offices or 2 kitchens, the user has the ability to customize the layout and size of the overall space. To improve space and transportation efficiency, each unit is able to fold and be compacted into a singular 1m x 1m x 1.5m box! Ryerson University's architectural science students are no strangers to participating in numerous design-builds and competitions outside of their curriculum. Their education not only provided a foundation to apply their knowledge and skills on a project outside of school, but their passion and interests led them to address real and relevant topics today such as Toronto's affordable housing crisis. "Knowing how to program, how to draft, how to design, and even knowledge of materiality from my education at Ryerson helped with designing homes in a short amount of time." Similarly, Shengnan Gao, applied her previous knowledge from designing a youth homeless shelter in her studio projects as well as past research papers on affordable housing into their team's proposal. 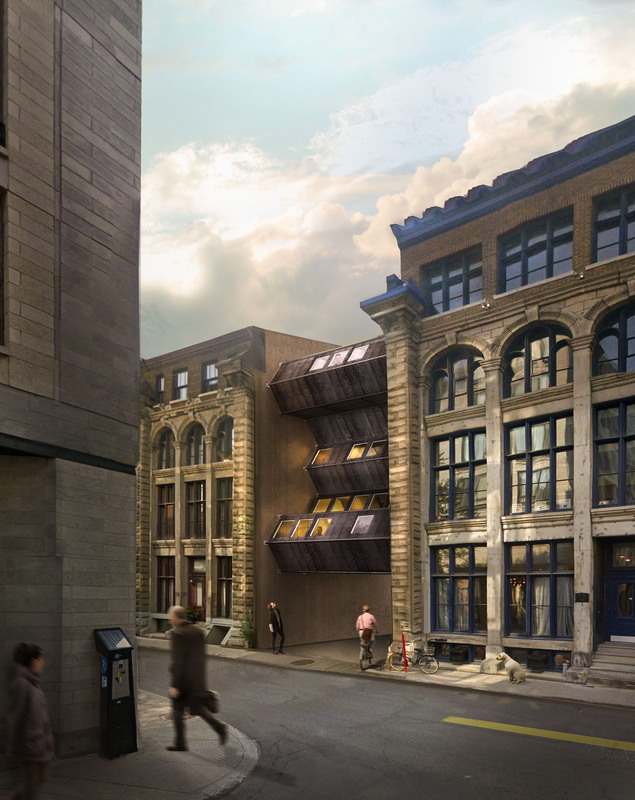 Looking at prefabrication techniques, she applied a design strategy that is unique to Toronto and Montreal cityscapes. With a rising housing market and increasing demand for home-ownership in metropolitan cities, who knows, maybe we might see their design shaping our cities in the near future! You can read more about their submitted design proposal at the CCA website. This article was researched and written by Agnes Yuen, an Architectural Science student at Ryerson University.